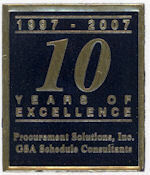 Government Contracts - Procurement Solutions, Inc.
Procurement Solutions, Inc. is dedicated to providing our clients with an affordable means of placing their corporate services, software, and hardware on the General Services Administration (GSA) Federal Supply Service (FSS) Multiple Award Schedule (MAS) contract. Retaining our services will save your company a significant amount of time and money. There are numerous avenues for companies to contract with the government for services. We know that the company which has multiple sources, and types of contract vehicles at its disposal, will be better positioned in the marketplace to accept an order from the government. Contact Us Now To Get Your Own GSA Schedule!